STR (Short Tandem Repeat) mutations happen every 100 years or so on specific places of the Y chromosome. These mutations are passed from father to son. By analyzing the types of STR mutations men have in common, you can calculate their relatedness. People with the R-Z16357 SNP have a fairly distinct STR signature. The following spreadsheet provides the STR values for all known (haplogroup names are highlighted) and suspected R-Z16357 people who have tested to at least 37 STRs. 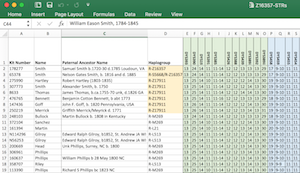 The people in this spreadsheet are primarily derived from the R-L513, the Phillips, the Smith, and the Vaughan FTDNA projects. The Phillips Group 29 people and the Vaughan/Vaughn Orange Group people closely match the R-Z17911 STR signature and likely have this SNP. The Smith Group R-M269-16 people closely matches the higher R-Z16357 SNP signature (with kit #178277) and likely fall in this haplogroup. Additional testing is underway to prove these. Additional Big-Y testers from the Phillips, Vaughn/Vaughan, and/or Smith STR groups would almost certainly create new, long branches down from their respective haplogroups. Additional testers are highly desired from these groups! There are certainly many people who have taken Y-DNA testing who have this STR signature, but have not yet been identified. By comparing STR differences, you can get an estimation of the relatedness or Genealogical Difference (GD) between men. 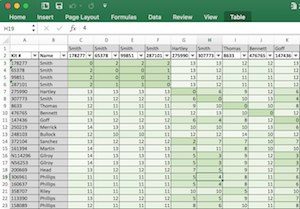 The following spreadsheet shows the *approximate* GD values for all known and suspected R-Z16357 people. The brighter green cells indicate a lower GD or closer relationship. You can sort by kit #s to see who they are most closely related to.